Baseball's Torre, La Russa, Cox Add Another Title: Hall Of Famer : The Two-Way Taken together, retired baseball managers Joe Torre, Tony La Russa and Bobby Cox won eight World Series titles and 7,558 games. Their names appeared on all of the voters' ballots Sunday. 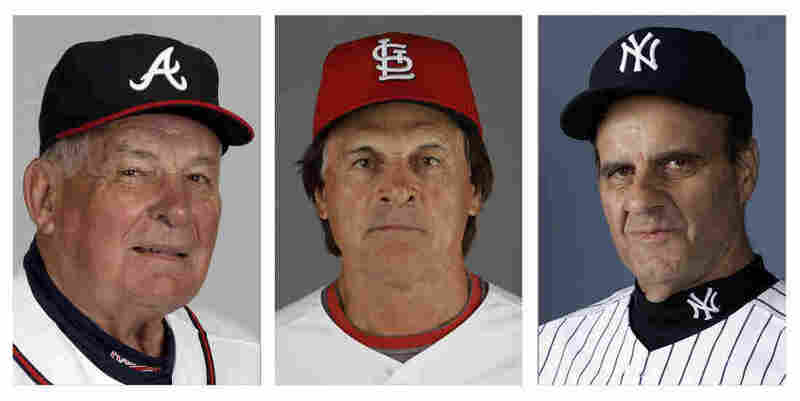 Hall Of Fame Managers: The Atlanta Braves' Bobby Cox (from left), the St. Louis Cardinals' Tony La Russa, and the New York Yankees' Joe Torre. Their paths repeatedly crossed on the way to the World Series. And now retired managers Joe Torre, Tony La Russa and Bobby Cox are headed to the same place: the National Baseball Hall of Fame. The Hall's Expansion Era committee announced its selection Monday. Together, the trio won eight World Series titles and led teams that were perennial threats to play in October. They account for a combined 7,558 victories. "Cox, La Russa and Torre were each named on all of the 16 electors' ballots," according to a statement from the Hall of Fame, "easily clearing the 75-percent level necessary for election." The three praised one another Monday during a ceremony in which they donned Hall of Fame jerseys and caps. "Managing against them, you certainly learned things," Torre said, according to The Associated Press. "I am honored to go into the Hall with these two guys." La Russa said, "Joe taught a lot of us about how to win the right way and lose the right way." "Cox skippered the Braves and Blue Jays for 29 seasons, leading his teams to 15 first-place finishes. From 1991-2005, Cox led the Braves to 14 straight seasons where they finished in playoff position. The Braves won five National League pennants and the 1995 World Series under Cox, who finished with 2,504 victories — the fourth-best total of all time. He won the [Baseball Writers Association of America's] Manager of the Year Award four times. "La Russa managed the White Sox, A's and Cardinals for 33 seasons, winning 2,728 games — the third-highest total of all time behind Hall of Famers Connie Mack and John McGraw. He led his teams to 12 first-place finishes, six pennants and three World Series titles — one with the A's (1989) and two with the Cardinals (2006 and 2011). His teams won 100-or-more games four times and he was named the BBWAA's Manager of the Year in his league four times. "Torre led the Yankees to six AL pennants and four World Series titles (1996, 1998-2000) in his 12 seasons in New York, and also managed the Mets, Braves, Cardinals and Dodgers — winning one division title with Atlanta and two with Los Angeles. His 2,326 wins in 29 seasons rank fifth on the all-time list, and Torre was twice named Manager of the Year by the BBWAA (1996, 1998). In his final 15 seasons as a manager, Torre led his clubs to the postseason 14 times. Torre also spent 18 seasons as a big league catcher/third baseman, earning nine All-Star Game selections and winning the 1971 NL Most Valuable Player Award." When the three are officially inducted next summer, Cox is expected to stand alongside two players who helped make his run of championship seasons possible: pitchers Tom Glavine and Greg Maddux, who are both coming up for election to the Hall of Fame for the first time. The 16-member Expansion Era committee that endorsed the three managers included former pitcher Phil Niekro, who played for both Cox and Torre and was once a teammate of La Russa's. Calling them "three kings of managing," Niekro said, "When I think of these guys I think of respect. By their players, by their fans, their organization. "They're men of integrity and character and I was honored and privileged to play for these guys," he added. Retired players who are elected into the Hall of Fame by the Baseball Writers Association of America will be announced Jan. 8. The induction ceremony will be held July 27 in Cooperstown, N.Y. In the committee's Sunday session, several contenders who had long histories in baseball didn't receive more than six votes. They include late New York Yankees owner George Steinbrenner and the late baseball union leader Marvin Miller, along with Billy Martin, Dave Parker and Tommy John.